The running back carousel that is the NFL keeps spinning and there are some new names emerging after week 10. There are also some familiar ones to keep an eye on due to struggles, but that will be addressed in the rankings tomorrow. For the moment, let’s take a look at how last week’s waiver wire picks performed and move on to the recommendations for week 11. I would not get rid of James Starks, but he was surprisingly ineffective against the Lions. Chalk it up to the unpredictability of divisional games, but beware of Lacy grabbing back a lot of playing time. White did nothing, but the loss of Amendola may change that. Hold onto James White for at least one more week. Bradshaw was on a bye of course, I think that he will no longer be available in a lot of leagues after week 11. Alfred Morris played well…against the Saints. The same can be said for every offensive player to face New Orleans. My recommendation to cut bait still stands. Get to know this man, he'll be seeing the field more from now on. 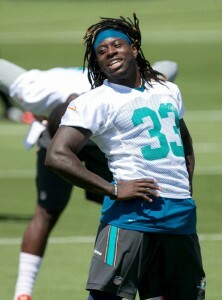 The Dolphins coaching staff are very excited about Ajayi. His ability as a rusher is likely to lead to more playing time, but Lamar Miller will still probably see every passing down. Miller is still a valuable back and Ajayi is not taking over for him barring an injury. For now, Ajayi is a flex play at best and a must-have handcuff at worst. You could certainly do worse when choosing a back that will be part of a time share. Also, it should go without saying that if you are in a keeper league this guy is an immediate add. I know I said not to play anyone from the 49ers, but with things getting thinner on the waiver wire a starting running back is worth having. Carlos Hyde is looking like he will probably miss at least another week, making Draughn the man for the Niners. They are going up against the Seahawks, so he will likely have a hard time contributing much this week. The fact that San Francisco is not going anywhere this year could lead them to shut down Hyde rather than risk further injury that is where Draughn could end up having some actual value. Allen has some real talent, but has not yet had much opportunity as he is stuck behind Justin Forsett. The Ravens are in a lost season at 2-7 and it bears watching if the coaching staff will decide to see what they have in their young back. Forsett is in a contract year and will likely want to put up the stats to get a lucrative deal in the offseason, but he could start to cede some carries as the NFL season winds down. Of course, that could mean a useful player in the fantasy playoffs for owners with bench space to stash Allen. Like the Seahawks before them, the Cowboys do not want to play Christine Michael. There was obviously something that they saw in order to trade for him, but he has not been good enough to pass Darren McFadden on the depth chart. I’m not convinced that Michael would be the next man up even if McFadden suffers his perennial injury. If you have the bench space, feel free to hold on to Michael but I am done with him.